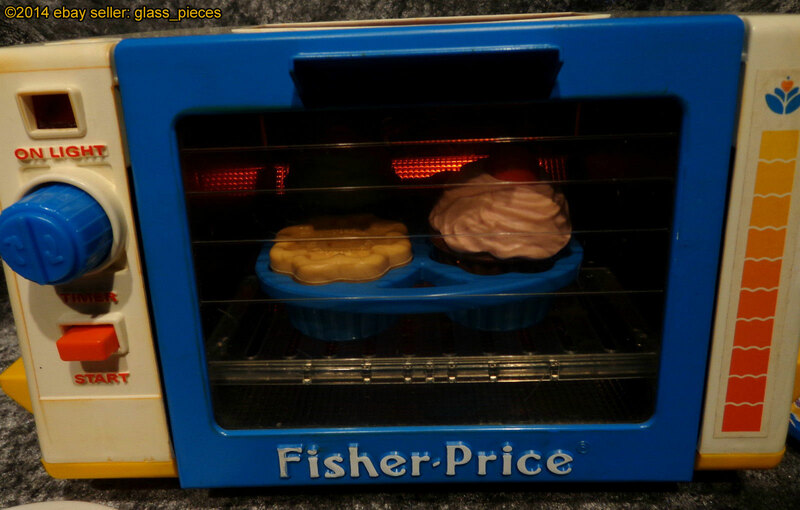 Description: The Golden Glow Toaster Oven is a white plastic pretend toaster oven with a clear-plastic door. The toaster has a working timer knob and an On/Off button. When the timer is set and the oven turned on, a red glow will appear inside the toaster oven. The red glow will disappear when the timer goes off. The toaster oven comes with a magic muffin that really rises when it put into the oven. The set also includes a slice of toast, a pat of butter, a plate, and a knife. The toaster oven does not really get hot, nor does it require batteries. Designed for children ages 3 to 7 years old. 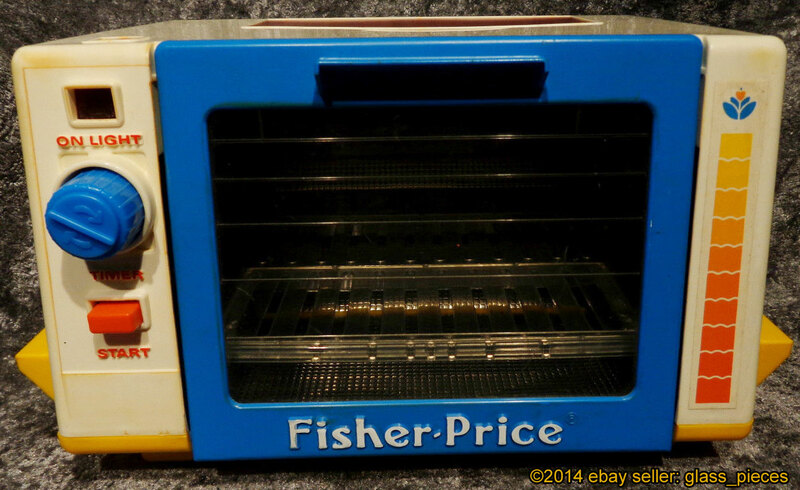 FPT7105 - White toaster oven with a yellow base, and a blue fold-down door with a large see-through plastic window on the front. Turn the timer knob on the front, and a realistic glow appears inside of oven. The timer ticks until a bell rings, and the red glow disappears inside when the timer goes off. The oven has a blue timer knob and a red On/Off button on the front, and a clear plastic see-through window on top of the oven. The oven measures 11-1/2" long, 6-1/2" wide, 7-1/2" deep. FPT7107 - Blue plastic muffin/cupcake liner (plastic version of the paper liners that cupcakes and muffins are cooked in). The sides of the muffin container are scalloped. *See "Variations" below. FPT44190 - Orange (Orange/Light Brown) sponge-material "Magic Muffin"with scalloped edges to fit within a muffin/cupcake liner. When stuffed within a liner, the muffin appears to "magically rise". FPT7108 - Round white plastic muffin can with a brown litho wrapped around the sides. The litho has a picture of three cooked muffins on a plate, the front muffin has butter melting on top. The litho also has the words "Fisher-Price" in white, and "Muffins" in red and white. Measures 3-1/2" tall x 2-5/8" diameter. FPT7109 - Round orange can lid. This lid fits on top of any round Fisher-Price Fun With Food plastic can. FPT7234 - White slice of bread with brown crust edges. The white sides are textured to look like real bread. FPT7111 - Yellow plastic slices of butter. This has 2 square slices of butter molded together. FPT7112 - White plastic plate with two blue rings around the rim and a red heart with blue "leaves" on 4 sides of the plate. Measures 5-3/8" diameter. FPT7113 - White plastic knife with ribbed edges on the end of one side. There is a tiny heart with 4 "leaves" under the heart molded on the end of the knife handle. The end of the handle is rounded. FPT7201 - Pink plastic muffin/cupcake liner (plastic version of the paper liners that cupcakes and muffins are cooked in). The sides of the muffin container are scalloped. FPT7114 - This set was sold in a 14-3/4" long, 14-3/4" high, 7-7/8" deep display box.